The European Space Agency's Mars Express spacecraft launched to the Red Planet in 2003. 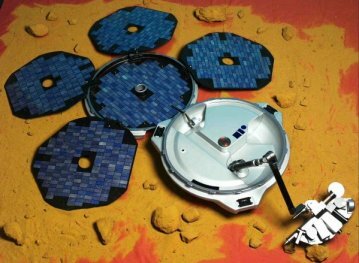 Part of the Mars Express mission was a lander named Beagle 2. The Beagle 2 was named after Charles Darwin's ship HMS Beagle which he used to sail around the world and study life, helping him to form his theory of evolution. The plan for the Beagle 2, after its safe descent and landing on the Martian surface, was to announce its arrival on Mars to terrestrial listeners with a burst of specially composed 'Britpop' music from the band Blur and then start its nominal 180 day mission to look for life on the Red Planet. The Beagle 2 craft, largely the inspiration and brainchild of one person, Prof. Colin Pillinger of the Open University in the UK, cost around �25 million. The lander was constructed by a consortium including several companies, various universities and ESA, together with support from the UK government. Once on the surface, the Beagle 2 was supposed to use its dynamic set of scientific instruments to burrow into the planet and take detailed stereoscopic images of the landscape, along with preparing rock and soil samples for analysis. Given the severe payload constraints imposed by the Mars In addition, a Gas Analysis Package (GAP), a sensitive mass spectrometer built within the body of the lander, was to test the samples for the presence of methane, a gas that is a sure indicator of active biological processes, i.e. life. Unfortunately, all these hopes and more for the Beagle 2 have been dashed as the lander failed to communicate. It is unknown exactly what happened to Beagle 2 after it separated from Mars Express. Scientists believe they spotted Beagle 2 on the Martian surface and have concluded that it landed incorrectly causing malfunction. 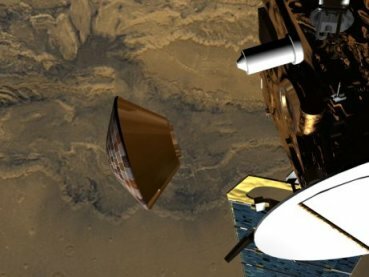 The rest of ESA's Mars Express has been successful, which is almost unusual in the exploration of Mars. There have been 38 launches to the planet Mars, but only half (19), have been successful. It almost seems as if Mars just not willing to give up its secrets that easily.